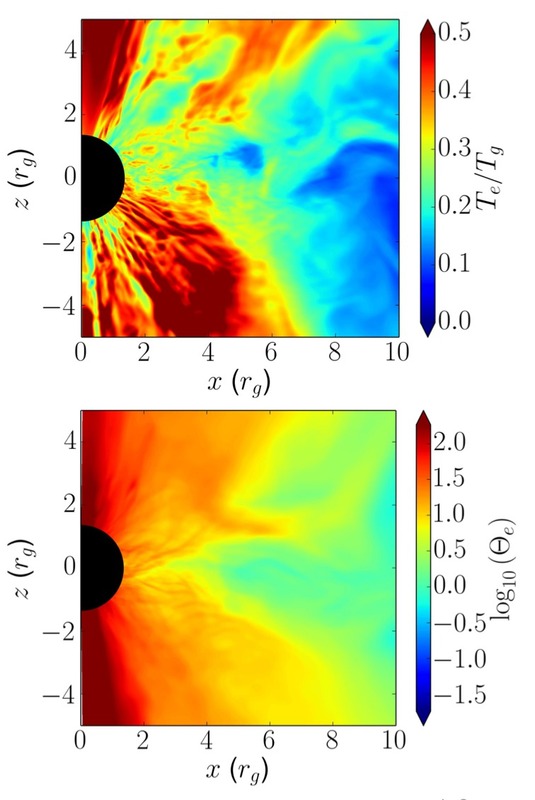 Polarized images of a black hole accretion flow (Moscibrodzka 2018). The lines show the electric polarization vector angle (EVPA), and colors show the polarization fraction. This animation shows the time-dependent simulated spectrum of a collisionless accretion model for the galactic center (Sgr A*). The model includes a novel treatment of electron thermodynamics that allows for a plasma beta dependent electron dissipation function, as well as electron conduction. Based on work by Ressler et al. 2015. This image shows the ratio of electron to ion temperature (top) and electron temperature in units of the electron rest mass (bottom) for a collisionless model of black hole accretion. The black hole is at the center left, and the physical model includes variable dissipation into ions and electrons as well as electron conduction. Based on work by Ressler et al. 2015. This image shows the density (left) and radiation energy density (right) for a rapidly accreting (super-Eddington) black hole accretion model. This model is pseudo-Newtonian and uses a sophisticated radiation transport scheme that solves the transport equation on a grid in photon direction. This work is described in Jiang et al. 2014. 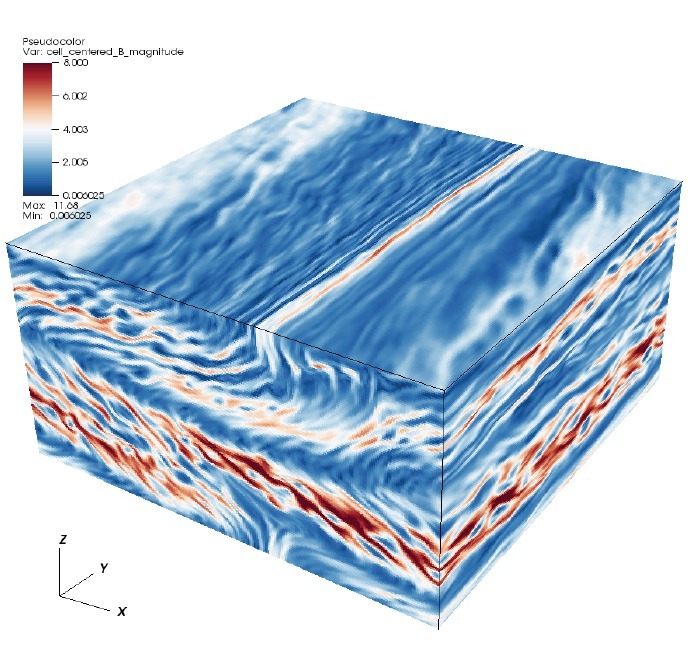 This image shows results of a particle-in-cell simulation of turbulence in a local (“shearing box”) model of an accretion disk. The color shows magnetic field strength. From Matt Kunz, Jim Stone, and collaborators. This movie shows a simulated image of the galactic center at 22GHz. 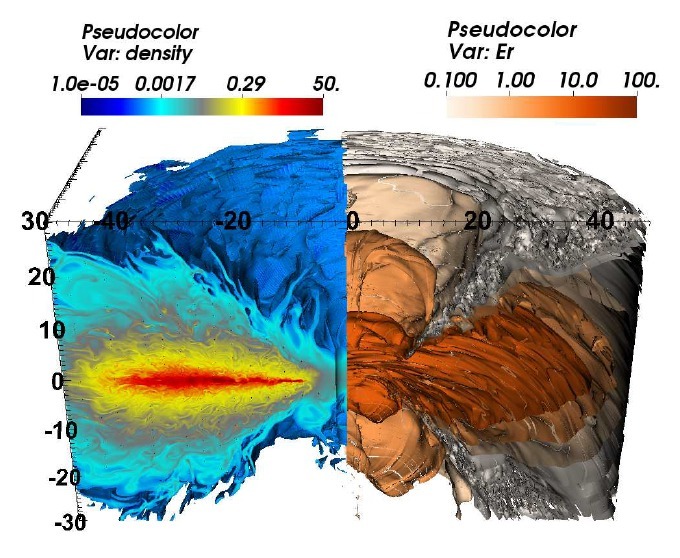 The underlying physics includes synchrotron emission and absorption, relativistic radiative transfer, and a 3D general relativistic magnetohydrodynamics simulation of the accreting plasma. Based on work presented in Moscibrodzka et al. 2014. This animation shows accretion of a collisionless plasma onto a black hole, as modeled by the horizon collaboration’s grim code (Chandra et al. 2015, in prep.). The left panel shows magnetic field lines and the logarithm of the density in an axisymmetric torus around the black hole (located at the center left). The right panel shows the conductive heat flux, calculated in our relativistic extended MHD model. In red regions the heat flux is as large as physically possible.